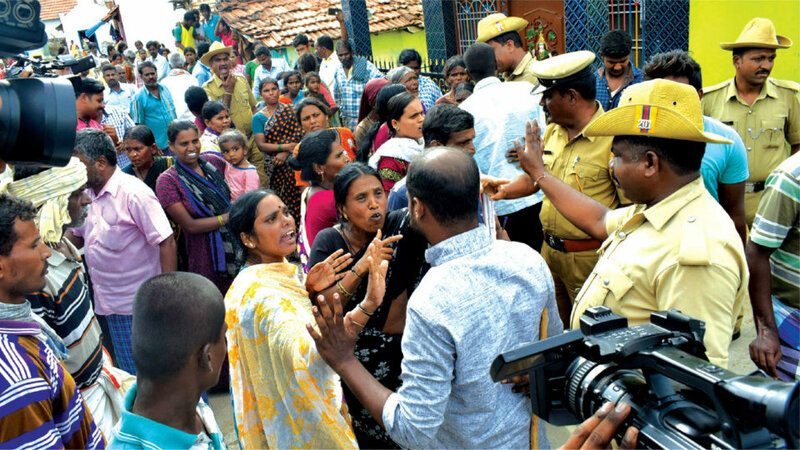 Gundlupet: Even as the controversy rages over the boycott of 25 families of Bommalapura village in the taluk for voting in favour of BJP candidate in the Gundlupet Assembly by-poll held recently, two warring groups entered into heated exchange of words and virtually came to blows right in front of State Women’s Commission Chairperson Nagalakshmi Bai, who visited the village yesterday to have first hand information about the incident. Following the incident, tension prevailed in the village forcing the Chairperson to order for a strong Police presence in the village. Bommalapura has been in the news over reports that 25 families have been boycotted by the rest of the villagers for voting in favour of BJP candidate. Nagalakshmi Bai, who was on a door-to-door visit at the village was hearing a family, when a shop owner of the village alleged that articles in his shop was deteriorating due to the boycott. Taking exception to the shop owner, another group refuting claims of boycott said that false rumours were being spread. This led to a war of words between the two groups and the Police intervened and diffused the situation. Nagalakshmi Bai realising that the village was tense, called Chamarajanagar DC B. Ramu over phone and directed him to enhance Police presence in the village and to submit a factual report to the Government about the incident. Just as the Women’s Commission Chairperson Nagalakshmi Bai left after realising the tense atmosphere in the village, a group of villagers is said to have assaulted a woman who had been to purchase ration at a shop in the village. The assaulted woman has been identified as Dundamma, 40 and has been admitted to Gundlupet General Hospital, where she is said to be recovering. Following the incident, KSRP platoons have been rushed to the village. SP Dharmendra Kumar Meena, ASP Geetha Prasanna, Tahsildar K. Siddu, TP Executive Officer Pushpa M. Kammar, Suresh and other officials visited the village.